Everyone knows the best way to spread Christmas cheer is singing loud for all to hear! We may have been blasting Christmas songs since Thanksgiving (#notashamed), but now that we are just a few days away from Christmas we’ve taken a deep dive into our favorite Christmas movies – preferably those with some musical moments. So, to spread the Christmas cheer, we’ve gathered up 11 of our favorite Holiday sing-a-long moments (and one honorable mention) for your spirited enjoyment! Keep in mind that they are in no particular order. The adorable Taylor Momsen singing this How the Grinch Stole Christmas’ original song was certainly a highlight of the movie and has a really lovely message about how easy it is to get wrapped up in the material part of Christmas rather than focusing on family and love. This little holiday mash-up between Anna Kendrick and Snoop Dogg was a nice surprise in a relatively flat sequel to Pitch Perfect and it makes for the perfect addition to any Christmas playlist. 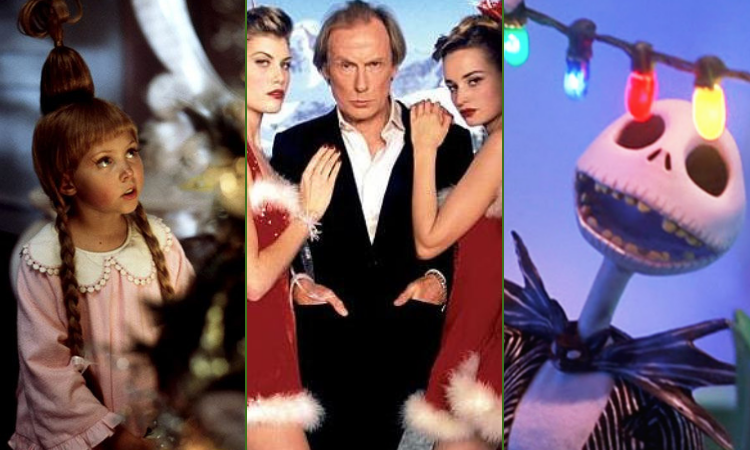 No matter what your feelings about Love Actually are, Bill Nighy took on the role of goofy crooner Billy Mack flawlessly and we were blessed with this Christmas classic that is sure to get stuck in your head immediately. While it may have given you unrealistic expectations when it came to school talent shows, this was one of the most enjoyable parts of Love Actually. Plus the adorable Thomas Brodie-Sangster on the drums definitely pulls at the heartstrings. The songs in The Nightmare Before Christmas were a fun twist of your classic holiday jams and Danny Elfman’s vocals as Jack Skellington made this song an instant classic that shines a light on the ‘creepier’ side of Christmas. Even those who love the ghoulishness of Halloween can’t help but get into the Christmas spirit. Let’s be honest, the entire soundtrack for ABC Family’s original movie The Mistle-Tones is fantastic. It was hard to even pick just one to highlight, but the film’s finale brought everyone together for one Christmas spectacular performance! Do yourself a favor and go watch the movie if you haven’t seen it yet – it’s great for any Christmas lover! Zooey Deschanel has such an endearing voice that captivates your attention as evident in this scene from Elf where everyone begins singing “Santa Claus is Coming to Town”, proving that singing aloud really is the best way to spread Christmas cheer. Will Ferrell strikes again. Daddy’s Home 2 was a surprisingly funny and heartwarming follow-up to the Will Ferrell and Mark Wahlberg 2015 film, but nothing was as entertaining as this random and hilarious rendition of “Do They Know It’s Christmas”. You’ve got Ferrell, Wahlberg, Mel Gibson, John Cleese, and yes, John Cena just letting loose and raging with holiday spirit. If you passed on the movie, definitely don’t pass on the clip above! Talk about a feel-good ending. When everyone begins singing “Put a Little Love in Your Heart” at the end of Scrooged, after Bill Murray had just broken the fourth wall, it’s hard to not sing along to the catchy tune with a beautiful message for not only Christmas but for the entire year. Bing Crosby’s “White Christmas” is assumed to be the best selling single of all time and it’s clear to see why. It’s a holiday legend and an absolutely iconic performance. If you haven’t seen Holiday Inn, I definitely suggest that you do so ASAP! There was certainly a lot of chaos going on in The Polar Express, but when it slowed down for this touching number about the true meaning of Christmas, the movie added another layer of depth to the already classic children’s story. Oh, The Plastics. 2004 was a bright time and the right time for Mean Girls to throw in a random Christmas number that has since inspired many Halloween costumes and stage moms. Plus anytime when everyone is singing along is always a fun time! What’s your favorite Christmas movie musical moment? Let us know!